Raise your hands if you have emotional kids! I think that everyone’s hands should be up right now. Mine would both be up, but it would be really hard to type if they were… I have four lovely, intelligent, extremely emotional daughters. From the oldest (preteen!) to the youngest (sweet, tantrum-thowing preschooler) we have such a wide range of emotions in our house every day, that my fight or flight sensors go off at least once every five minutes… So far I’ve been able to resist the urges… When I heard that Inside Out was on DVD, I knew that I wanted to get it. We hadn’t seen it yet, but I kept hearing great things about it. 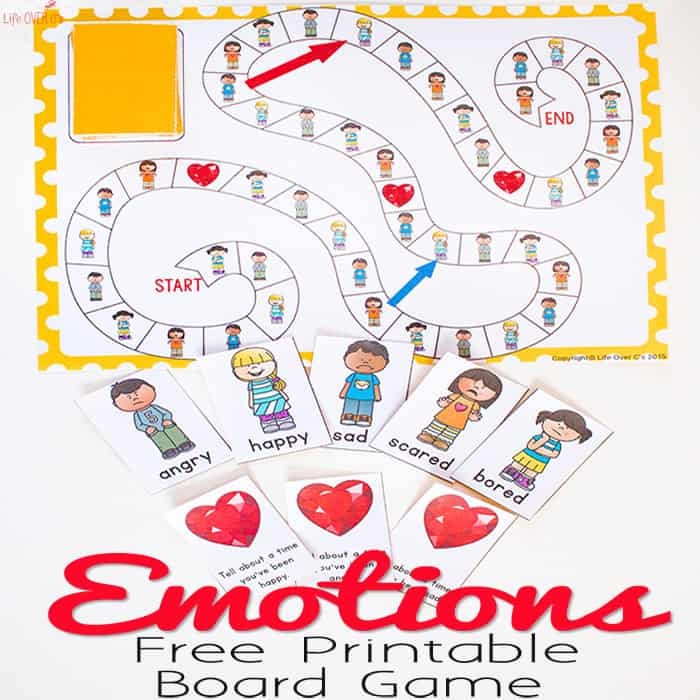 So we planned a family movie night complete with this free printable emotions board game. So much fun! When I picked up the movie, I also picked up some of the Inside Out TOMY character toys from the movie. My preschooler, who had seen the previews, instantly recognized Anger and was able to imitate the emotion with ease. I knew that we had a winner since she really needs hands-on ways to learn about things. 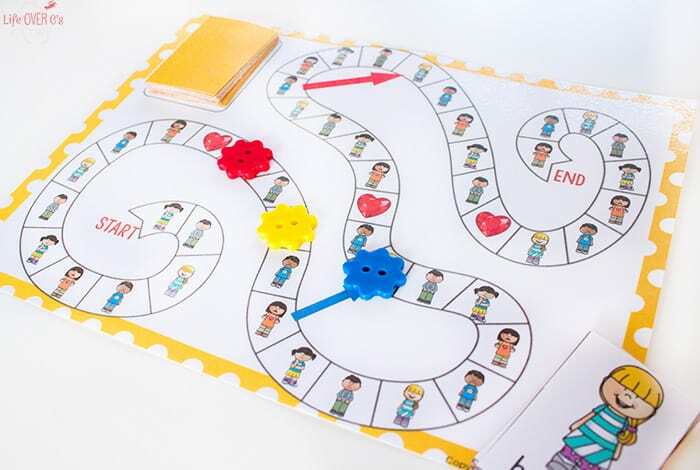 Place your marker on the “Start” of the board game. Place all the cards upside-down on the “Card Draw Pile”. If a “Heart Gem” card is drawn the player will head to the closest Heart Gem space, even if it is behind him. He should answer the question that is on the heart card. This can be a great way to launch conversations with your kids about how they are feeling and might give some insight into why a particular child is acting out or having difficulties. Smaller children might be able to point to the Inside Out toy for that feeling or demonstrate that particular emotion, since they might not be able to recall an actual time they felt that way. If it’s appropriate you can talk about the experiences as a whole group. If you have a sensitive child, you may want to allow them to give short answers and then later have a one-on-one talk with the child. If I didn’t take the time for one-on-one conversations I would never know that I have a child who is terrified of being lost in a store because she’s scared in this new-to-her country. Or that a child who seems “tough” on the outside really needed a cuddle. Inside Out can be a great conversation starter. Especially for families like ours who have moved so much. 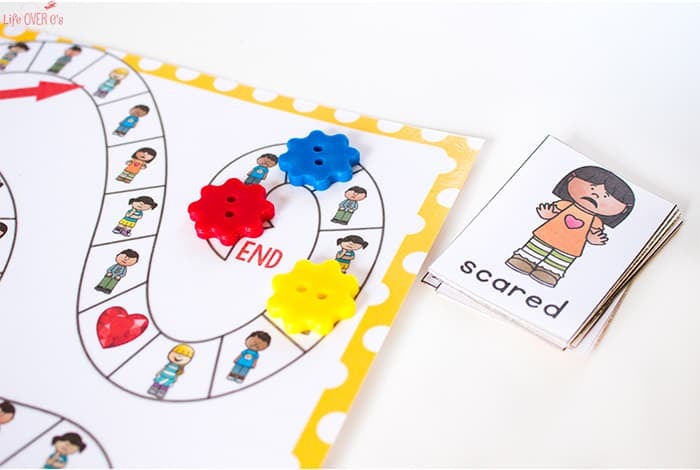 More Hands-On Learning Activities You’ll Love! 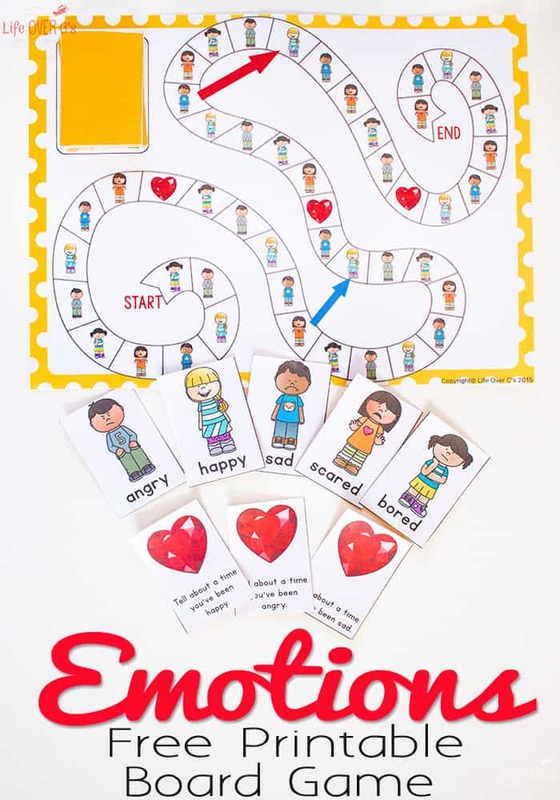 I love this post and how it allows kids to explore their different emotions. Love the board game and Inside Out of course. What a wonderful resource. 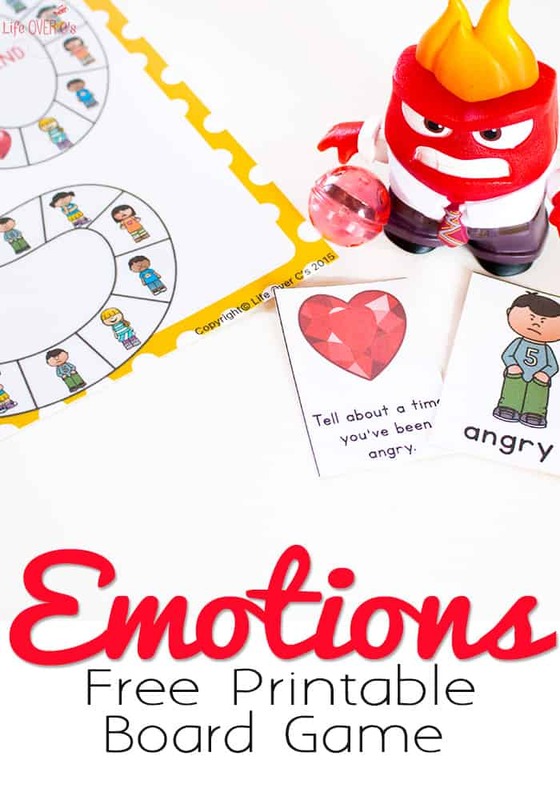 I have a kiddo who struggles with emotions that would love this game. Thanks for offering this!! Wishing you a blessed Thanksgiving!! Happy Thanksgiving to you too! Glad you like the game! I can’t seem to find the board game. The downloadable link should be at the bottom of the page.